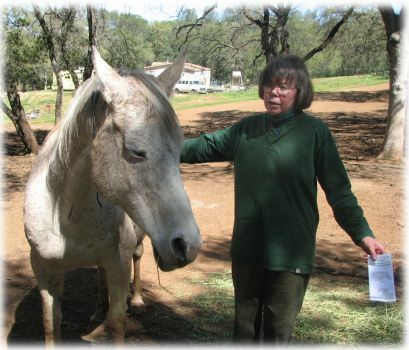 Several of our supporters emailed us this letter that Caroline wrote to the editor of HorseBack magazine. It’s a very good letter and we would recommend that you take the time to read it. Click here, the letter is on the left side a bit down the page, it’s the letter to the editor. America has been freed from the blood of murdered horses on our own soil, but now several states are trying to revive this wretched behavior. Please read the article and do what you can to help. 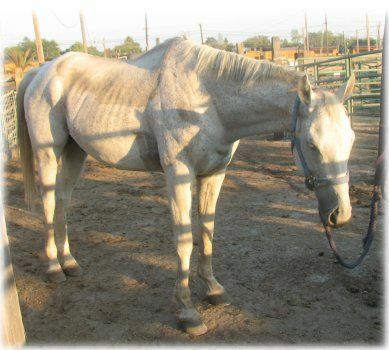 Many of you probably remember Mariah, the poor skinny off the track TB that we rescued from auction. After arriving at our rescue he started gaining weight and looking better. He was adopted by a very loving individual and he got to move to Hawaii. We got an update on him today! “I just wanted to send you just a few pictures of our boy Mariah, a.k.a. “Goose.” He’s a different horse, super happy, 7 buddies in his 30 acre pasture, and he is is exceptional health. We’ve taken it slow with him, allowing him ample time to settle in, fatten up, and get his feet and body back into shape, from the outside in. We absolutely love Goose! It took a little time to rehab him, and gain his trust, but it’s been well worth it, we couldn’t imagine life without him now. 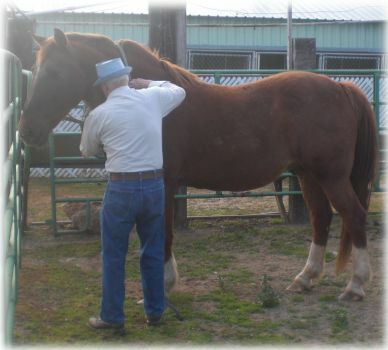 He is so easy to handle on the ground, my husband loves grooming and taking him for walks. My husband was able to come home from Iraq for Valentine’s Day (also his Birthday) for 2 weeks of R&R. He got to meet Goose and fell in love with him. When my husband returns from Iraq in October, he should be able to ride goose, my husband’s a beginner rider. He’s a beautiful boy now. It is so sad that there are so many horses that have experienced fame and glory, and then when their owners are done with them, they are discarded like trash with no concern for their future. 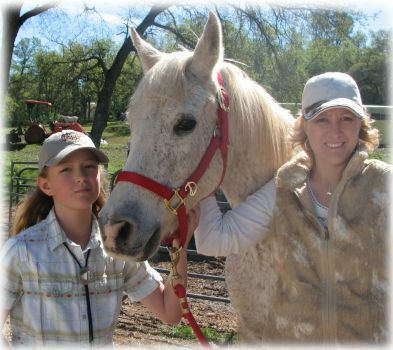 Thanks to you we can make a difference in so many horses lives like Mariah, now named Goose. Claire worked on doing emails, answering phones, and all that other office type work that has to be done. 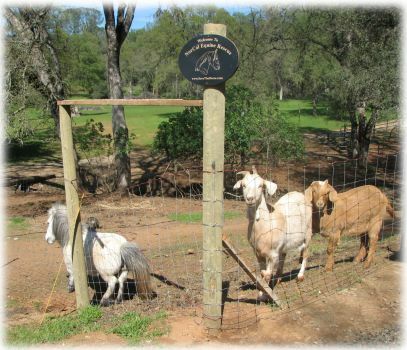 It was a beautiful day, the mini’s and the goats seemed to be quite happy with the weather. 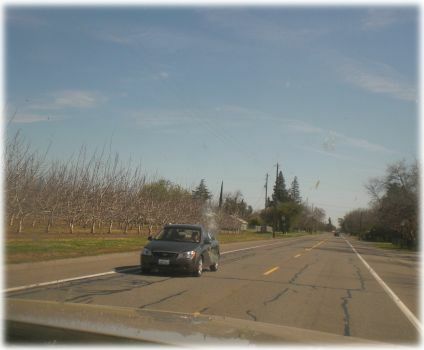 Jamie picked up the donation can at Tractor Supply in Yuba City yesterday and brought it out to the rescue, while Jason and Tawnee were gone. She wanted to volunteer entering information into our database, but unfortunately Jason and Tawnee were off rescuing Boo-A and forgot to let her know. She dropped off the donation, it came to almost $100! 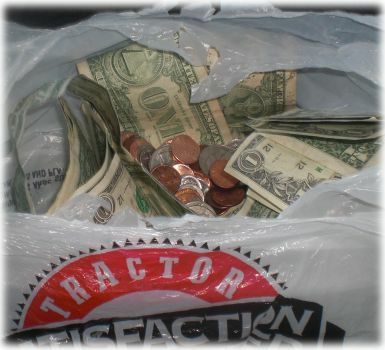 Thank you Tractor Supply for helping us help horses in need. Omar’s new family finally got approved, thank you for your patience. They were so excited that they were approved they came out to get him today. They sure do look happy. He was a good boy, loaded up in the trailer and was enjoying his snacks while they prepared to take him home. Claire also showed horses to a visitor who came out today. A visitor placed an adoption hold on Belina as well. 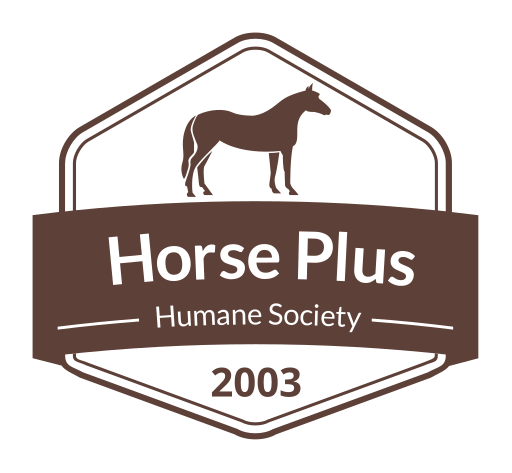 Thank you so much for opening your heart and home to a wonderful rescued horse. And where were Jason and Tawnee? There was another horse that needed to come into the rescue today. So, they were on the road once again. 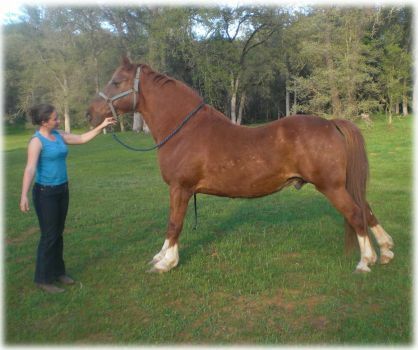 The horses owner purchased Red when he was 3 years old, and now 14 years later his owner can no longer keep him as he is moving. 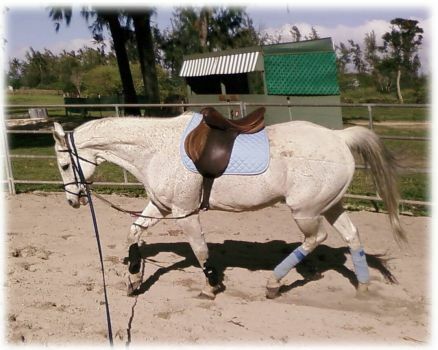 He has not ridden Red in 2 years as he can no longer ride due to health issues. 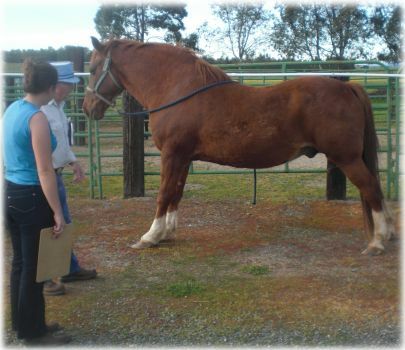 When Red’s owner took him out of his pen, he showed us how Red knows how to stretch out. He is definitely a nice sweet boy. Is seems to be super well behaved, he has just been sitting around for awhile and needs his feet trimmed. 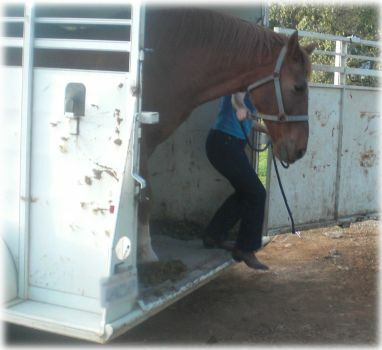 Back at the rescue Tawnee unloaded him. Before we settled him in, we wanted to get a nice picture of him posing for the camera. Red has been used for almost everything, hunting with dogs (you can fire a shotgun off his back) and his owner was just no longer able to keep him. 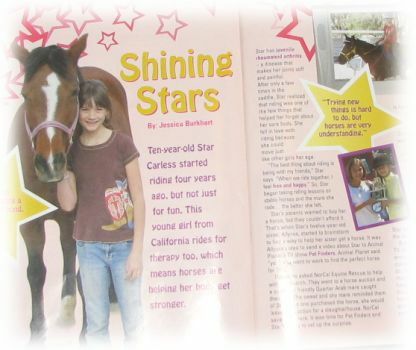 Many of you have probably seen one of the horse magazines named “Blaze.” One of our supporters was reading it along to her grand daughter when she suddenly stopped: it was talking about NorCal Equine Rescue! So, she gave us a copy of the magazine. They did a feature article about Mya and Star, and thankfully they gave a mention about us too. They didn’t get Mya’s rescue quite right, but overall it is a cute article. It’s in the current issue of Blaze, so if you check it out, you can read it too. Great outfit Tawnee, I love your jeans. The pic with you on the green grass with the horse is cool.